I love Burberry but the price tag makes my wallet cringe. This classic giant check crinkled scarf retails for $325 at Saks. If the real thing isn't in the current budget, Mimi's The Look 4 Less has a fantastic lookalike which retails for only $25. You can click HERE to view or purchase, OR you can enter the giveaway. 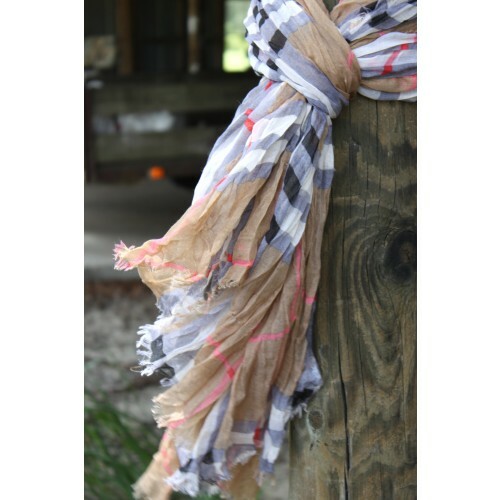 That's right, Mimi's The Look for Less is giving away one of these scarves to a lucky Look 4 Less reader! 2. "Like" Mimi's The Look for Less on Facebook and/or follow them on Twitter. 3. Comment below with your email address and what your favorite item from Mimi's The Look for Less is (visit their store HERE) to complete your entry. Note: One entry per person, additional entries will be deleted. The giveaway will be open until September 23rd and a winner will be chosen using random.org. Good luck! My favorite item from their site is the Ostrich Look Italian Leather Purse - So Lovely! I like the tan checked scarf..so many ways to wear it. I LOVE the Italian Leather Zippered Messenger Bag / Wristlet on Mimislook.com. Its so cute and functional! This is the first time I've seen your new blog layout! Very fresh looking, I like it! What a great shop! I think I'm equally loving the large envelope clutch and cut crystal and gold petit chandelier earrings. I'd wear either very often. I'm following on twitter. so much to choose from! I think I like the Turquoise Seven Strand Necklace best. thanks! opps i hit the enter button instead of the other one ha. heres my one entry then!! My fav item is def the adorable Turquoise Seven Strand Necklace ! following them on twitter, and liked them on fb. I like Look for Less on facebook! I love the Diane Warner gold square earrings! My email is manette@insightbb.com! LOVE the Turquoise and Feather Necklace! Liked on FB and followed on Twitter (@Marmendy)!! Gorgeous! And I love your blog! I liked on FB (Wanda Staton Galloway). Following on Twitter. I LOVE the scarf. 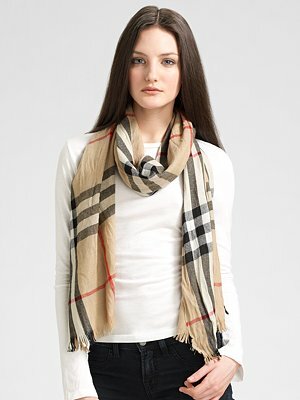 I have been wanting a Burberry scarf, so this would be perfect!!! Love it! It looks exactly the same! And I'm following them on Twitter. My favorite piece is definitely the pearl cable cuff (just like David Yurman!). Love the ostrich purse, pearl cluster earrings, crystal cluster earrings, etc all great stuff!! Love Mimi's Starfish Drop Gold #3 Earrings! Liked on FB. LOVE the gorgeous tan checked scarf you have pictured, but also adore the Large Face Silver and Gold watch. Read your site every day...such a treat! I liked on Fb! The Circular Filagree Gold Earrings are super cute! Lots of great accessories! I'm loving their stylish Large envelope clutch! And I'm following Mimi's on Twitter too. My favorite item on the website (other than the scarf) is the large face gold watch! I like the stud earrings. Very elegant. Love the turquoise and gold ornate bib necklace! I Liked on FB. Love the silver cable bracelet w/hook closure. I could work a pair of those like nobody's biz. I love the starfish cuff and the scarf!! Liked on fb! I love the Ostrich Look Italian leather purse!!! Love the silver and gold bangles. Following on Twitter! I love the turquoise and gold bib necklace! I like Mimi's Golden Bib. I have been lusting over the Burberry version for awhile! This is definitely a more wallet-friendly option. I love it! I love that scarf, but the Infiniti Leather Wrap Bracelet is gorgeous, too. I like te look for less on twitter and FB. What a beautiful scarf! I like the Gold Large Link Necklace and I follow on twitter! Love the Ostrich look Italian Leather purse... such a classic look! My email is jmccormick@hollins.edu & LUCKILY my friend turned me on to Mimis! I have 2 favorites right now, the turquiose starfish earrings & my gold leaf filagree earring (goes with everything!) Dying for this lookalike scarf & next on the list: The Boyfriend Watch! giveaway and I like them on facebook! --- My fave item is the Summer Bling Bracelet in LIME. Favorite item is the scarf--I just love scarves in general. They make every outfit something unique! I liked them on FB. My favorite item is the scarf! LOVE the large envelope clutch w/ detachable strap!!! so cute! I love the large envelope Clutch! I am now following them on fb! I have been wanting a necklace exactly like the Extra Long Silver Coin Necklace. It's such a great price too! I 'liked' Mimi's on FB. My email is agarcia9903@gmail.com. I'm following Mimi's on twitter! I love the coral seven strand necklace - the color's gorgeous. I am a follower and I "liked" Mimi's on FB. My favorite item is the Shimmering Metallic Disc Gold Earrings. My favorite item in the store is this pair of Soft Mint Teardrop Earrings! Love them! I like you on facebook & I LOVE the turquoise 7 strand necklace!!! love the turquoise and gold ornate bib necklace. following on twitter and liked on FB as "FastInTogether"